Ascend Hospice is dedicated to providing innovative, quality care, and wellness to our communities to help them live better lives. By being a hospice volunteer you can take great pride in knowing you've made a positive impact in someone's life and in your community. From our teen volunteer program to comforting families during the final hours. Ascend Hospice offers opportunities for individual's ranging in age from teens to senior citizens. 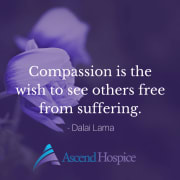 Ascend Hospice is committed to providing best-in-class care with everyone we connect with.